Kenai Fjords National Park is immense. It covers an area of more than a thousand square miles (by comparison, the state of Rhode Island is roughly 1,200 square miles). 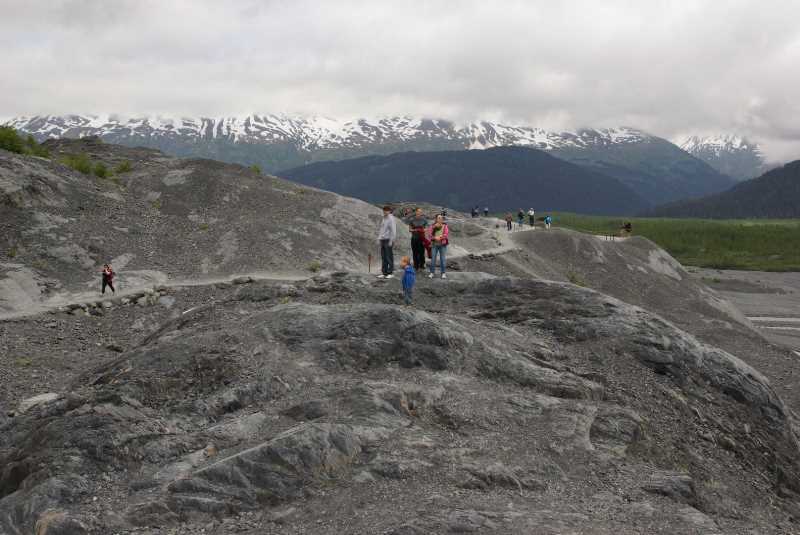 Most of that area is covered by the Harding Icefield, and it too is so big it’s hard to comprehend. Most of the park can only be reached by boat, but there is one road which barely touches the northern corner of the park. 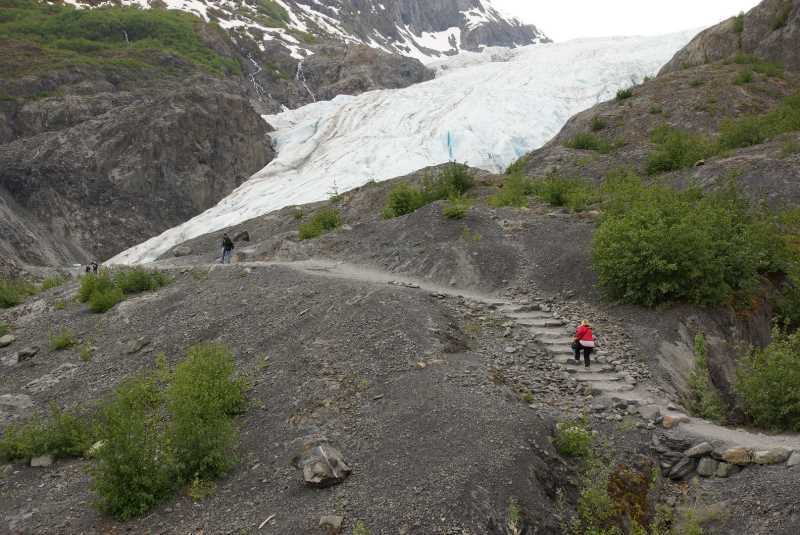 You can drive up from Seward, and hike a couple of trails that overlook Exit Glacier — just one tiny appendage of the massive ice field. 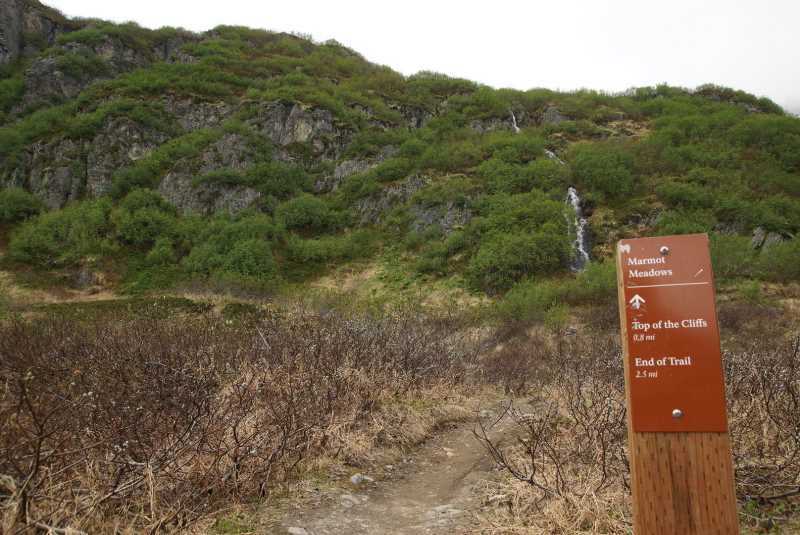 If you’re visiting Seward, you really need to drive up here. 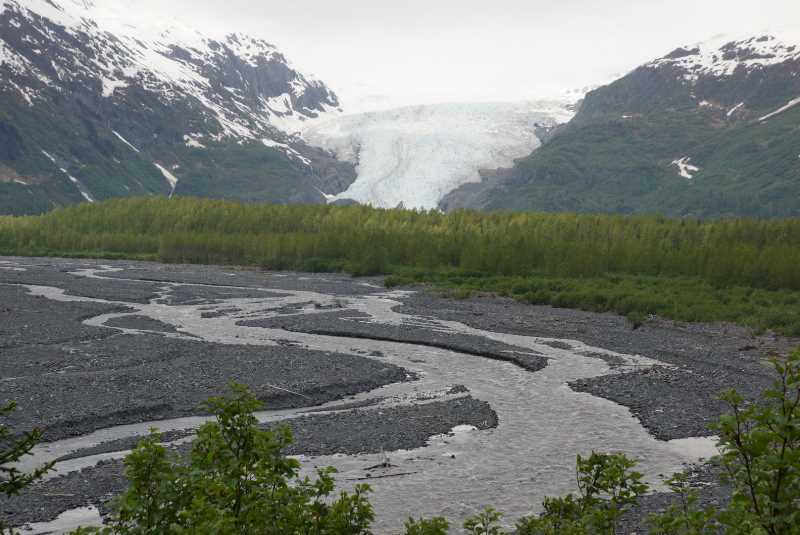 The road to Exit Glacier is at mile 3.7 on the Seward Highway — in other words, it’s just outside of town as you head north. A 9 mile paved road takes you into the park. I started my visit with a stop at Kenai Fjords’ visitor center, which is located in the marina area of Seward. I mentioned to a park ranger that I wasn’t happy with the weather — overcast, but not rainy. She assured me that, on days like this, the glacier actually looks better. I’d probably see more blue in the ice. So, I made the drive up to Exit Glacier. As you head out the park road, you’ll see where you’re headed. 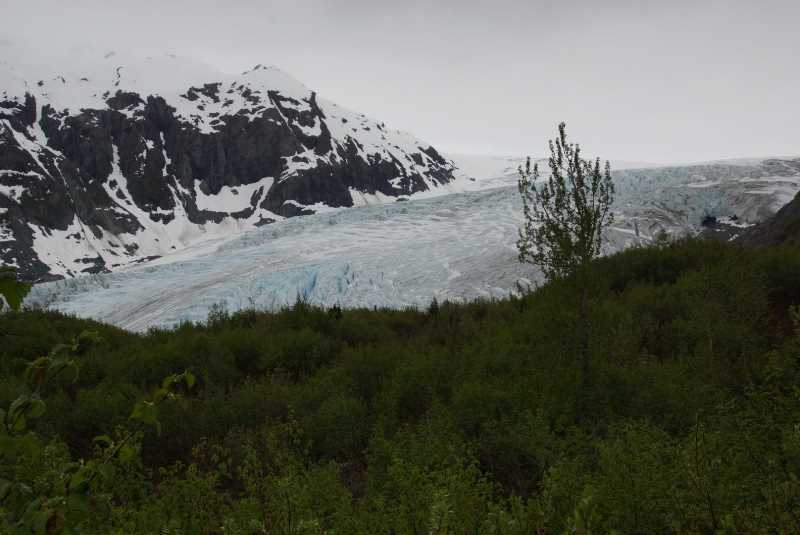 That’s the glacier, right out there, slowly flowing down between the mountains. 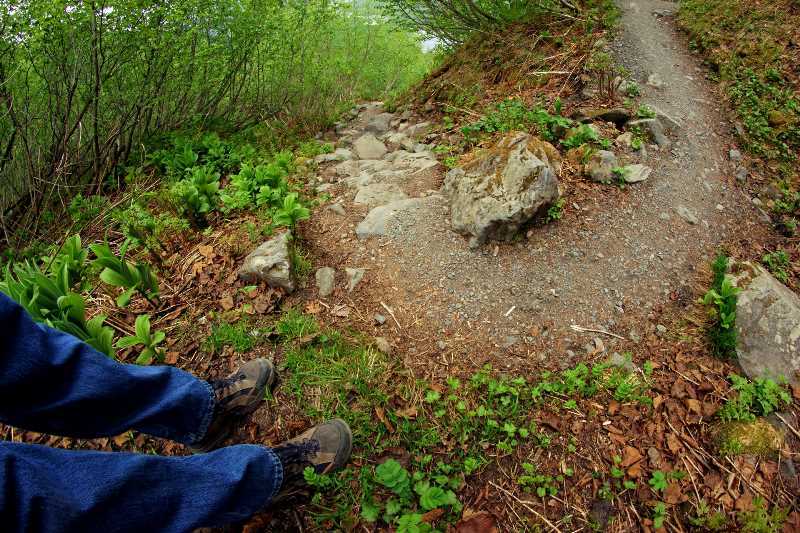 Once you’ve parked, you have your choice of a simple trail, or a longer hike. 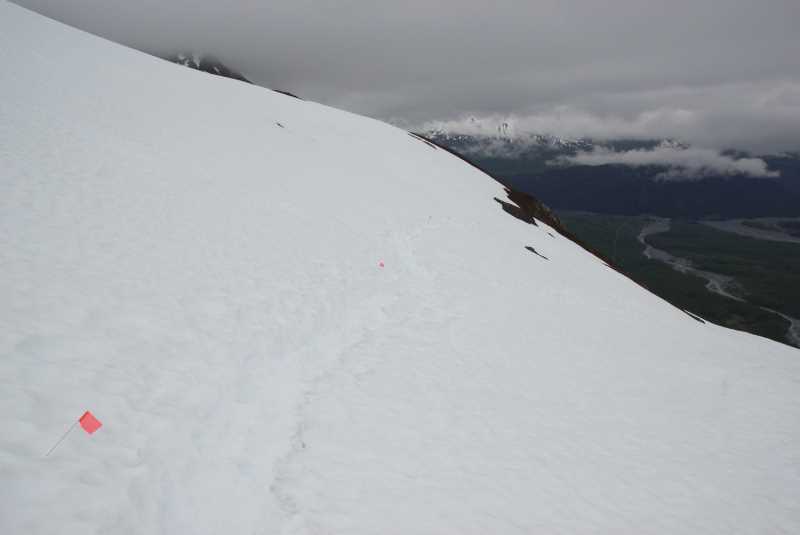 Both begin along the same path, which is marked with signs showing the former location of the tip of the glacier. 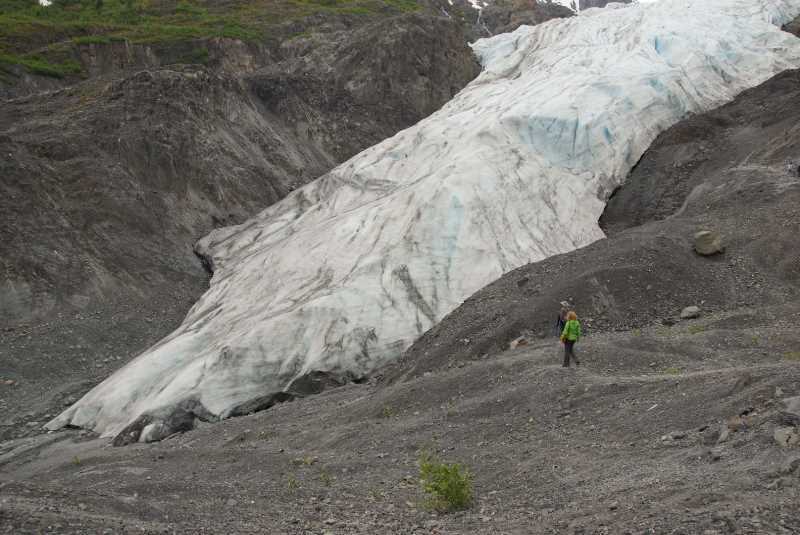 Like most icefields in Alaska and around the world, the Harding Icefield is shrinking. 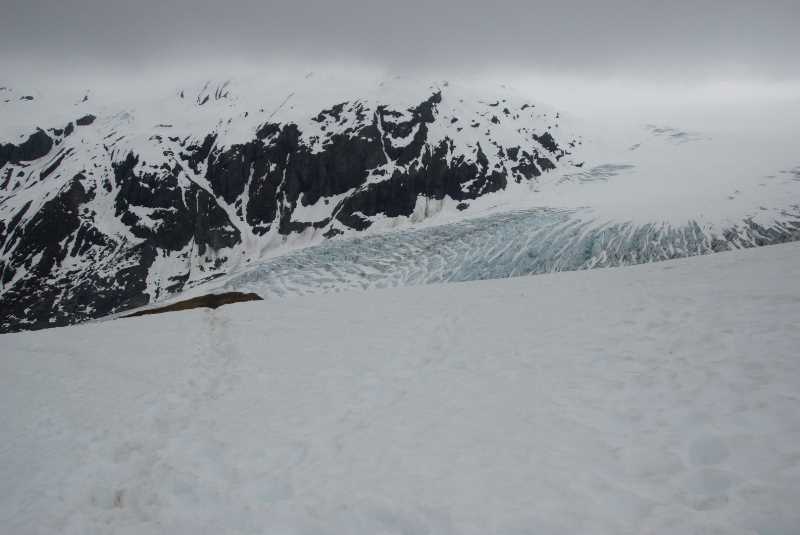 The NPS website says it has noticed a 3% reduction in the icefield’s coverage area, over 16 years, although it doesn’t specify the exact time span. 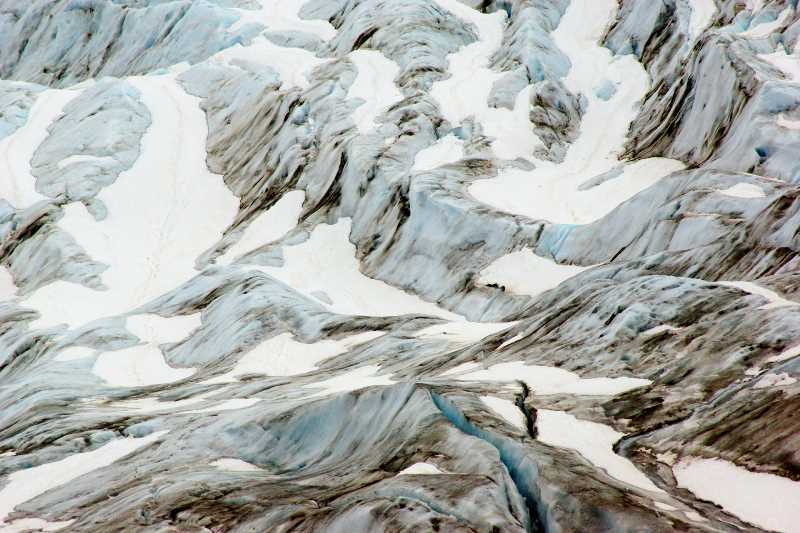 The change at the end of the glacier is more obvious. 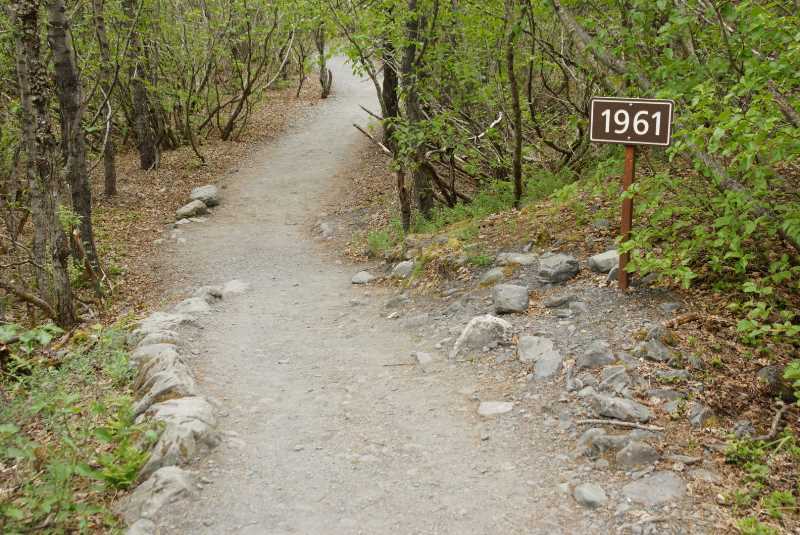 In 1961, it reached this point on the half-mile trail up to the current tip. In 1899, it stretched back to a spot along the current-day paved road. 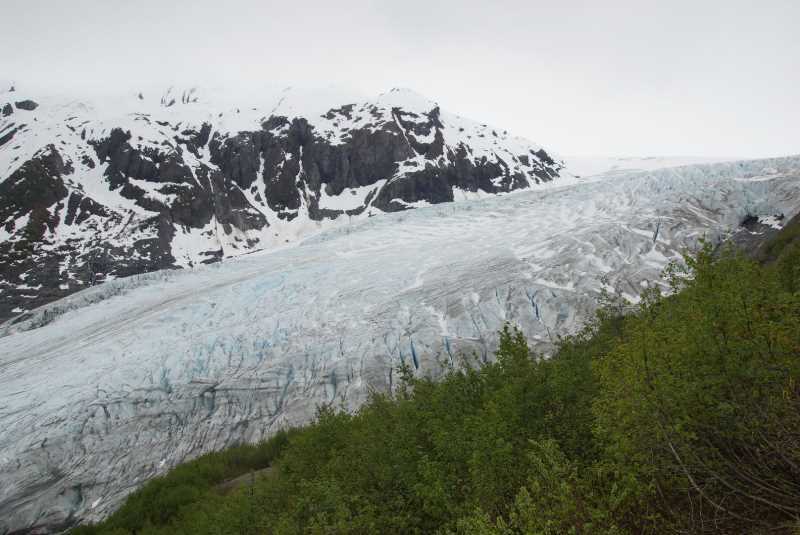 Climate change concerns prompted President Barack Obama to visit Exit Glacier in September, 2015. 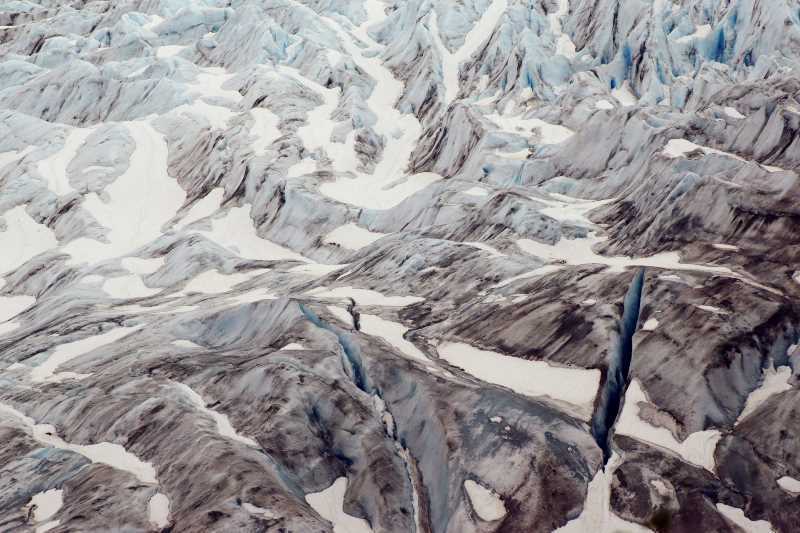 He used the glacier’s retreat to illustrate changes in the arctic climate. 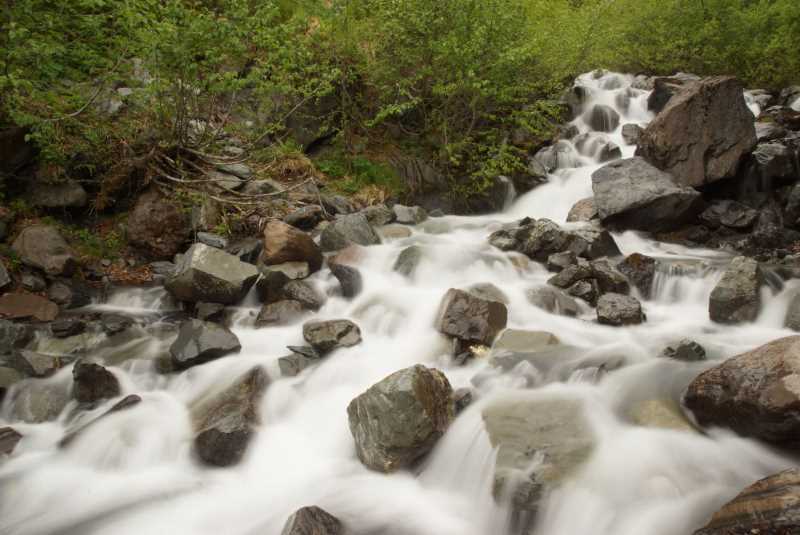 … which doesn’t take long, and is fairly easy to hike. … where you’re allowed to get this close. 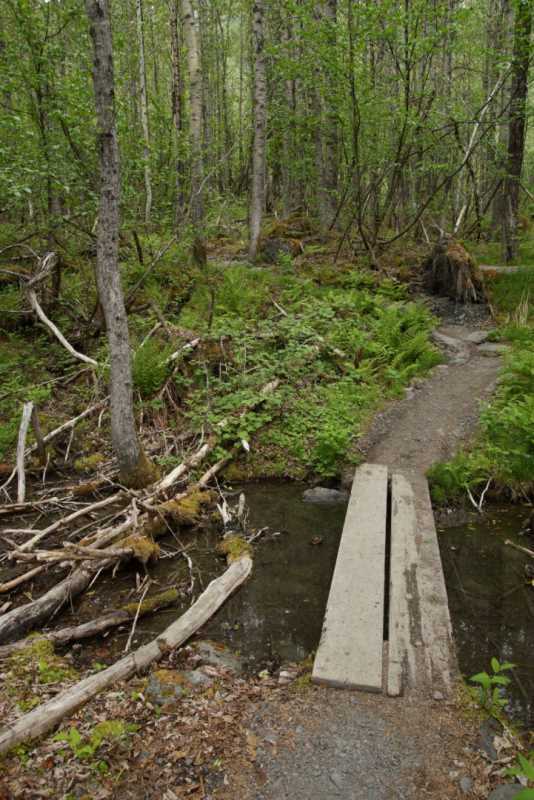 Ropes at the end of the trail and signs provide strong discouragement from going any further. In this picture, I’m sitting on the ground, with my feet under the rope. So, this is as close as you can get. Since this hike was short and easy, I decided I was ready for a bigger challenge. 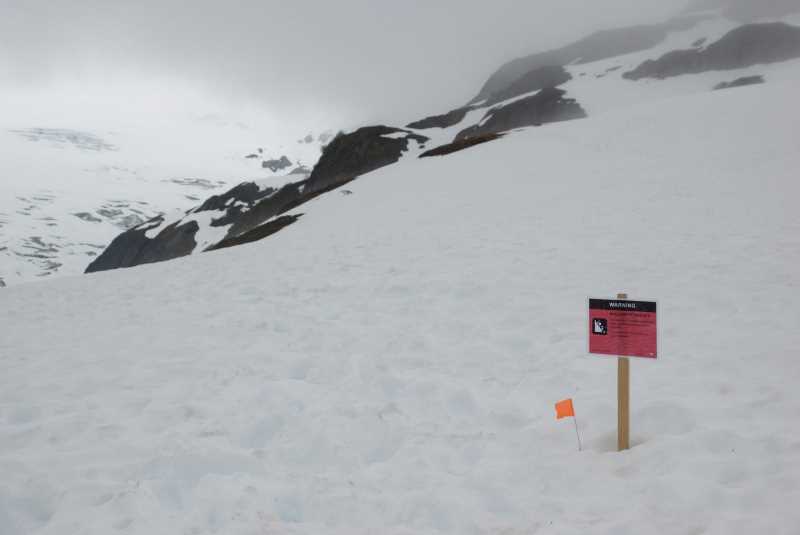 The Harding Icefield Trail seemed like a really big challenge, but I knew that in late May, the upper end of the trail was closed due to avalanche danger. I decided I’d hike as far as I could, see what I could see, and then turn around. 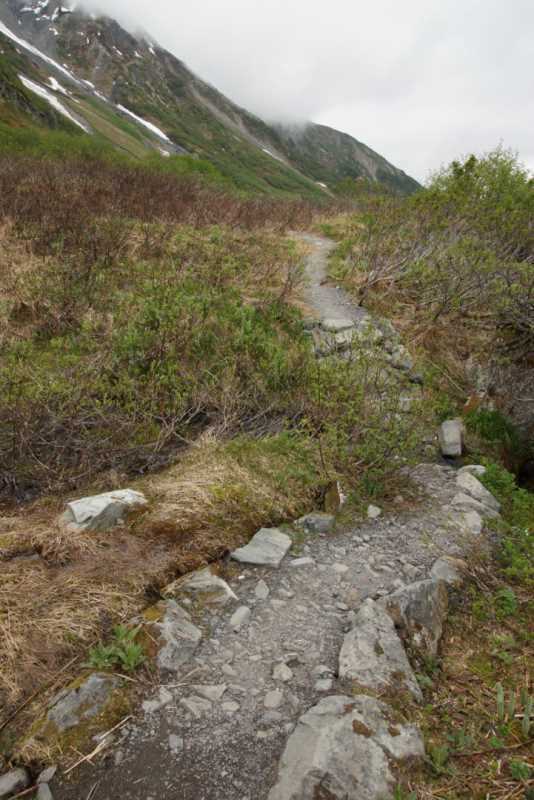 From the end of the Edge of the Glacier Trail, I had to backtrack a short distance to the start of the Harding Icefield Trail. At the trailhead, this encouraging sign greeted me. 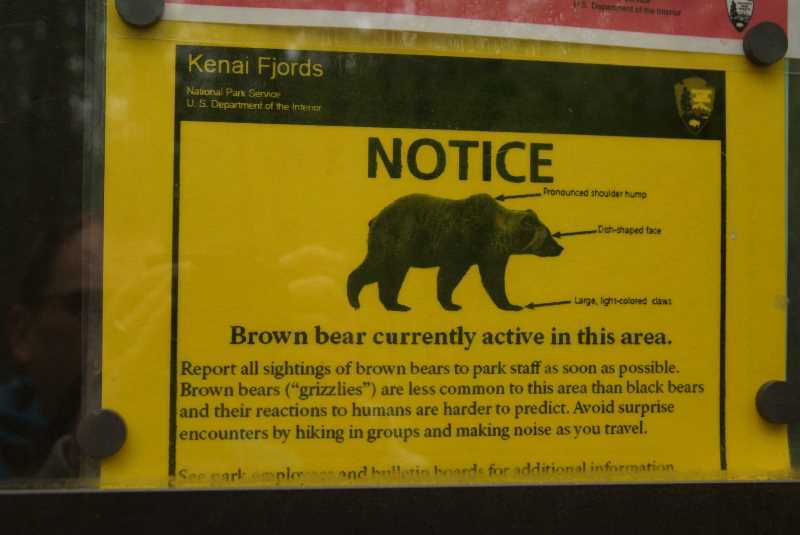 Brown bear activity in the area. Not laid-back, friendly black bears, but brown bears — a.k.a. Grizzly Bears. 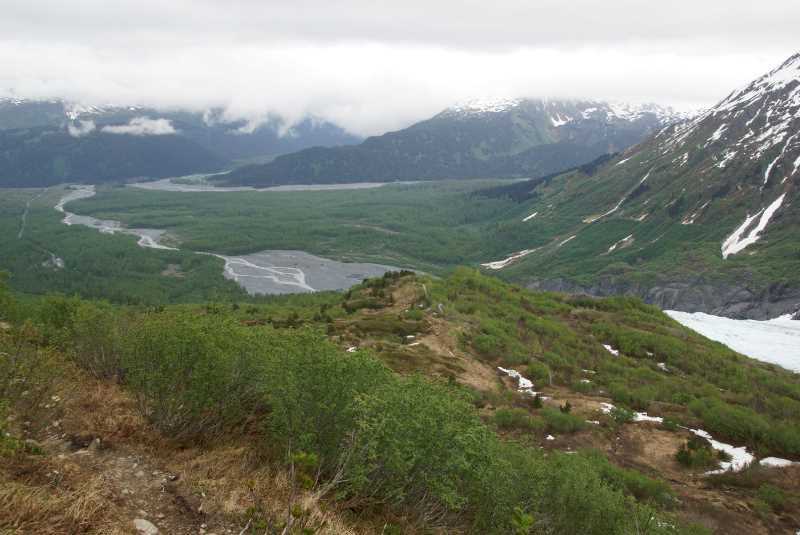 Eventually, you get another good look at Exit Glacier, as you approach Marmot Meadows, which is at mile 1.4 on the trail. Marmot Meadows is not exactly flat, but it’s a nice break from the uphill climb that preceded it. 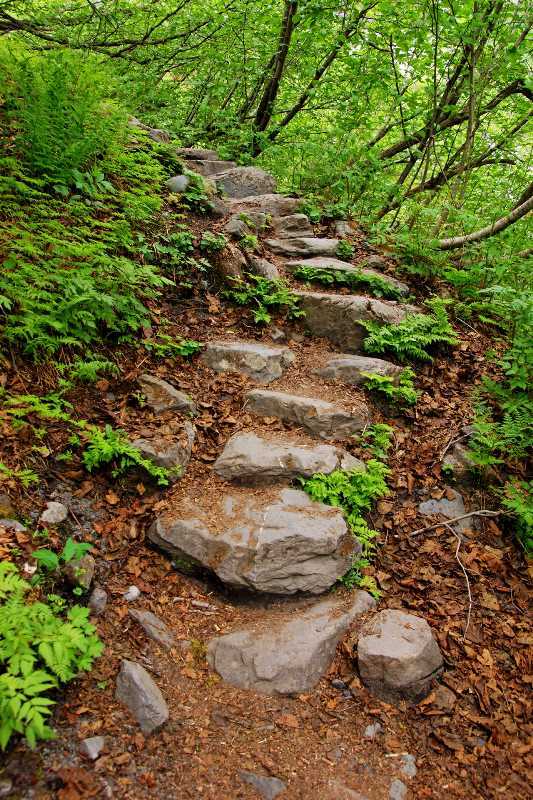 You’ll also appreciate it, when you see the next phase of the hike. 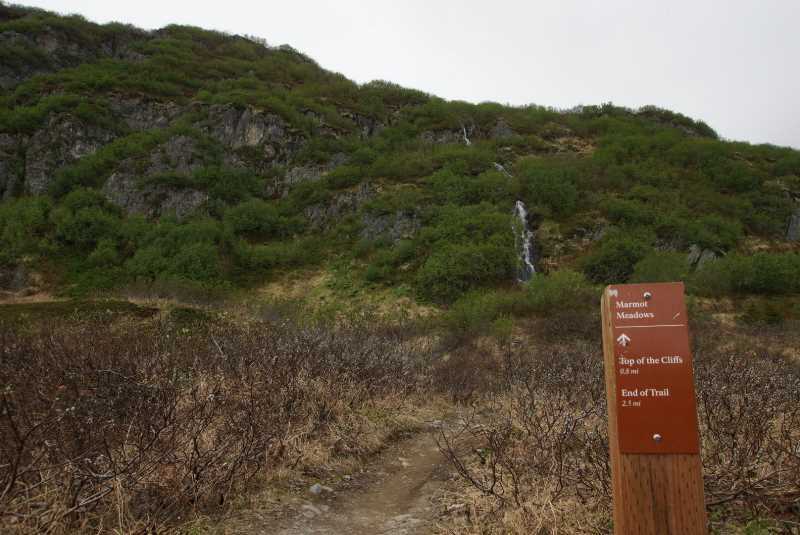 Bottom of the Cliffs is at mile 1.8, and Top of the Cliffs is at mile 2.4. In between, there’s a lot of climbing. 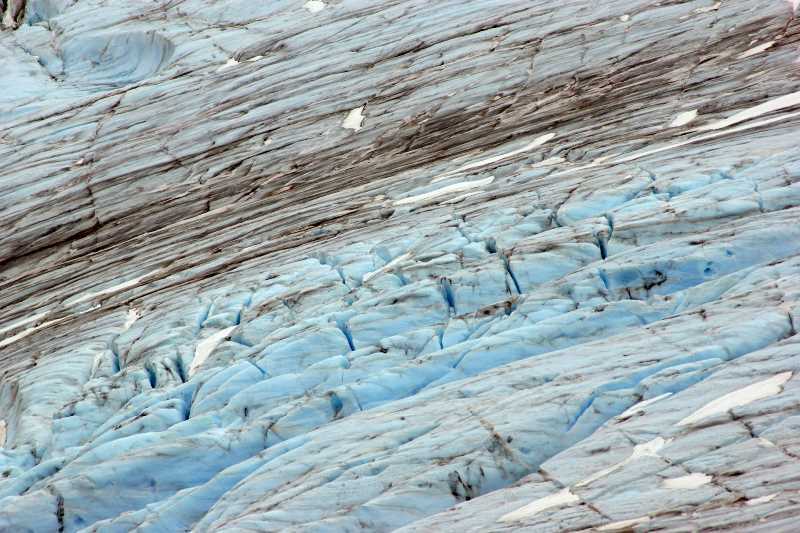 … and admire the glacier’s blue ice. Is it better because it’s cloudy? Sure, why not. Speaking of clouds, I had a feeling that I was missing some impressive cliffs in the surrounding area. I only got an occasional peek at the mountains, during brief breaks in the grey blanket. 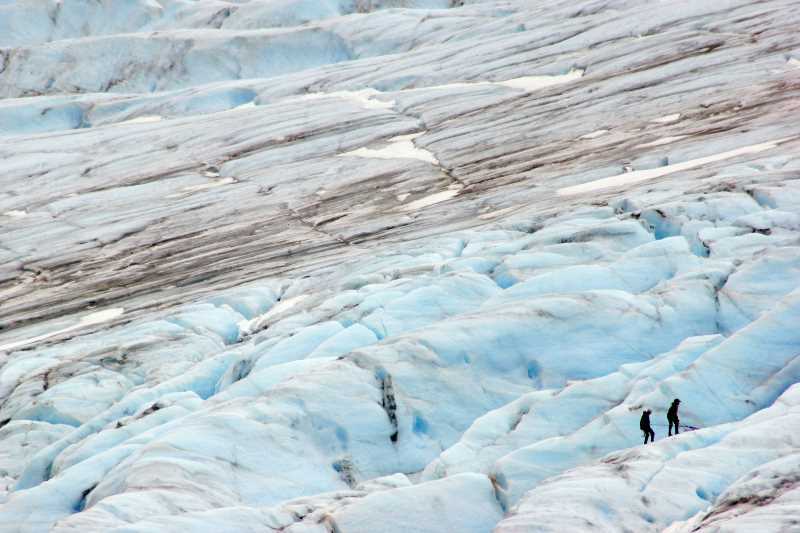 It took me a while of staring at the glacier, to notice a couple of adventurous hikers on the ice. 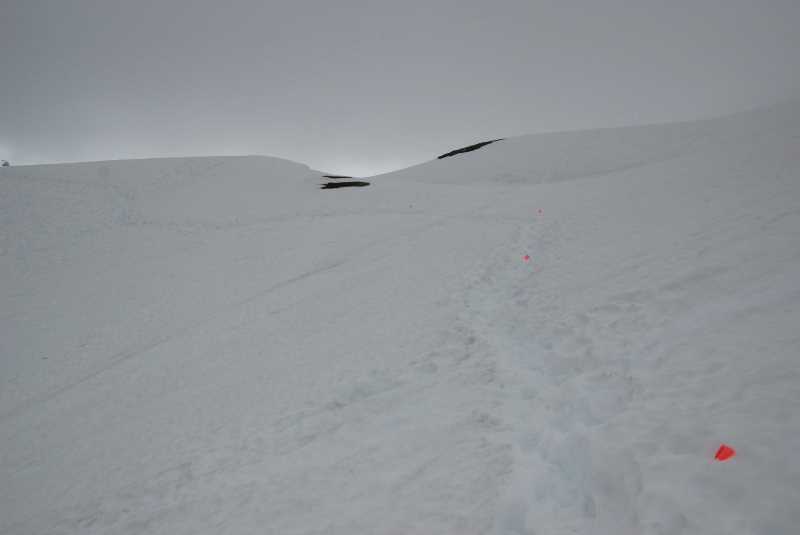 After a few moments, one of them disappeared into a crevasse — not plunging to their death, thankfully. These were well-equipped and skilled ice climbers. A few other people at the viewpoint discussed going further up the trail. They all reached a consensus: the view was good enough from here. While I agreed, I knew it could get better. So, back at the trail again, I decided to go up that cliff. It was a tough climb, for sure. I’m not sure of the exact elevation gain from the bottom to the top of the cliff, but it’s easily several hundred feet, maybe a thousand. The entire 4.1-mile trail gains about 3,000 feet (give or take, I’ve seen conflicting numbers), and certainly a big portion of that climb happens here. 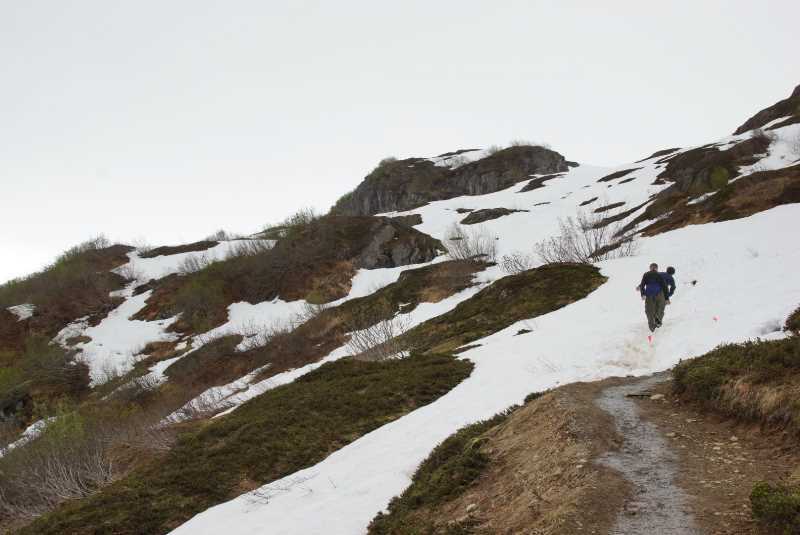 … this is still Alaska, in late spring. 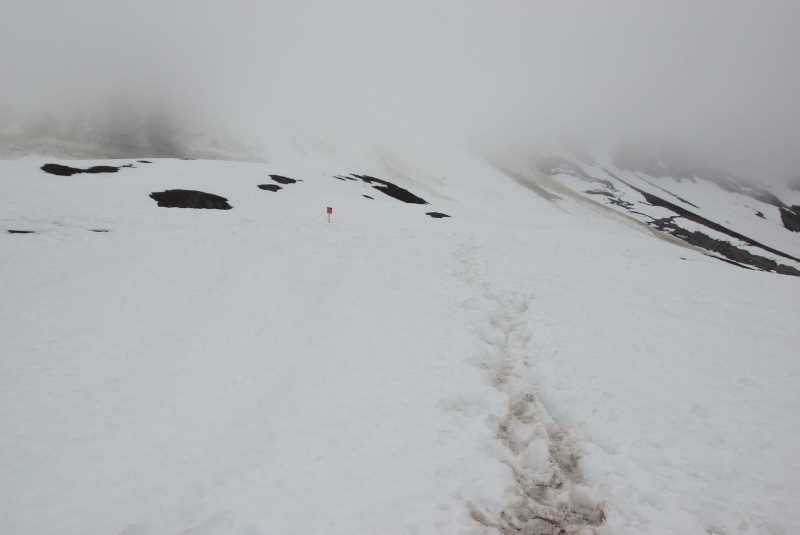 Soon, the trail was completely covered by deep snow. That little orange dot in the corner is a trail marker. Enough markers had been placed on the route that I could follow it. And, it also helped that around this point, I ran into a couple of other hikers — one of which hiked with me, as far as we could go. … because I was allowed to hike out to a tiny outcropping of dirt, where a fantastic viewpoint awaited. 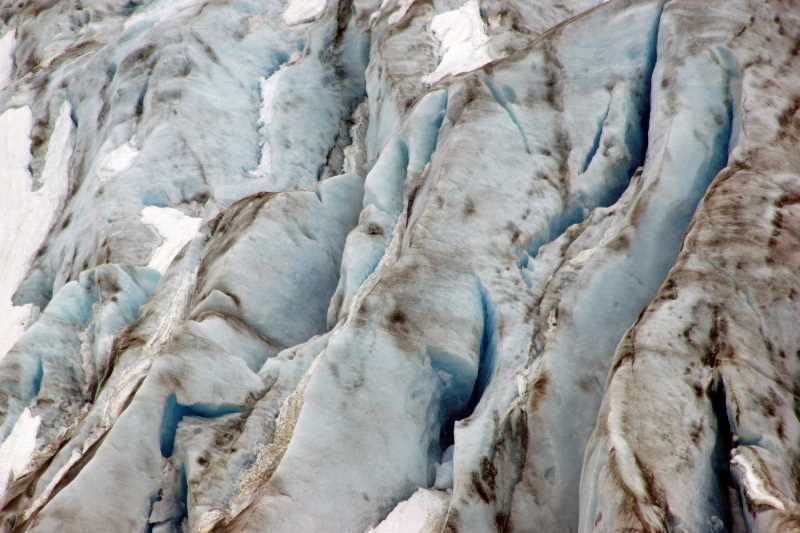 … and those scary crevasses. Looking back from the viewpoint, I realized I had a tough journey ahead. My companion on the climb uphill had already turned around and started the descent. Also, it was getting foggy up here. If I could have climbed any higher, I probably couldn’t have seen anything. 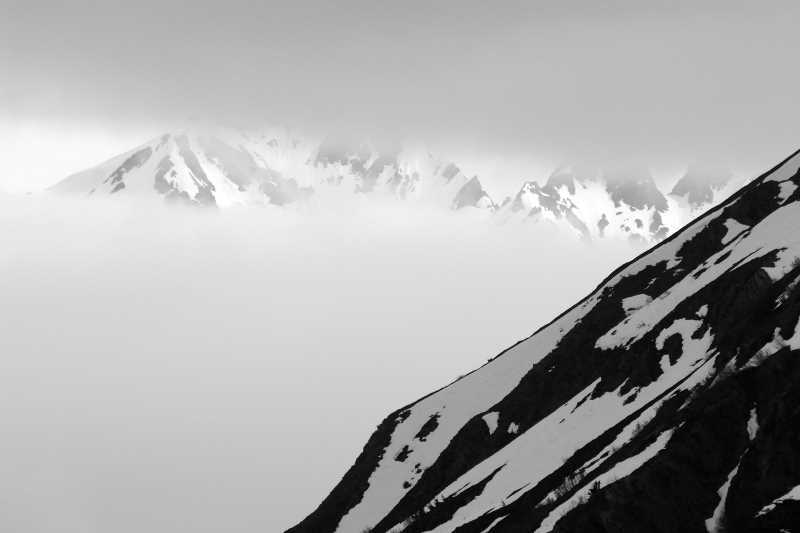 … catching occasional glimpses of the mountains through the clouds along the way. 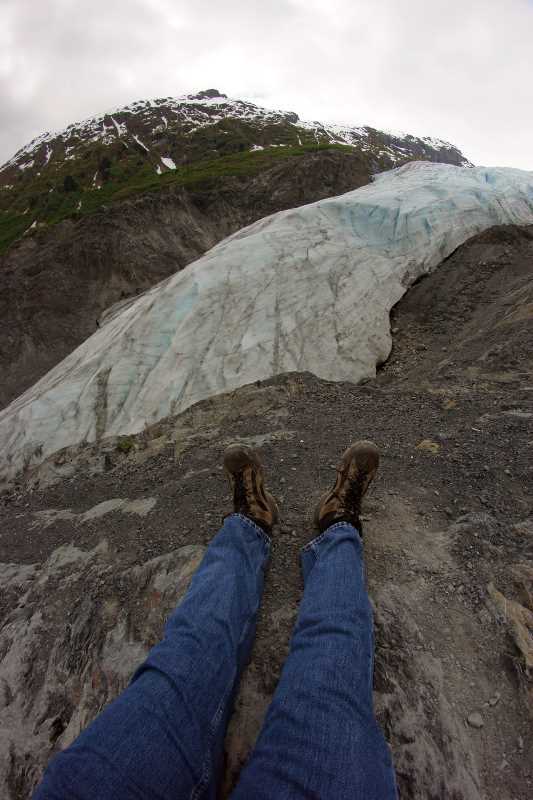 The entire hike at Exit Glacier and the Harding Icefield Trail took 5 hours, 42 minutes. It was a pretty intense and exhausting day. If the entire trail had been open, it would have been even longer. But, the views are worth it. Here’s a look at the dashcam video of the drive around Seward, and out to Exit Glacier.